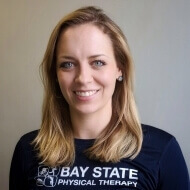 Robyn graduated from Northeastern University with her DPT in 2013 after completing her B.S. in Biology at Clarkson University in upstate New York. Her interest in physical therapy was sparked by her background as a competitive swimmer throughout both high school and college. Robyn is passionate about working with patients suffering from orthopedic injuries, helping patients return to pain-free daily life and the activities that they enjoy, while promoting an emphasis on functional movement patterns. She has an interest in sports medicine and manual therapy including Maitland techniques, IASTM, cupping, joint mobilization, and Kinesio Taping. Outside of the office Robyn enjoys photography and traveling, and continues to maintain an active lifestyle through hiking, swimming, and taking pilates classes.